A "new McCarthyism" has emerged in response to WikiLeaks and is evidenced in the calls for assassination by US politicians, the site’s editor-in-chief said today. 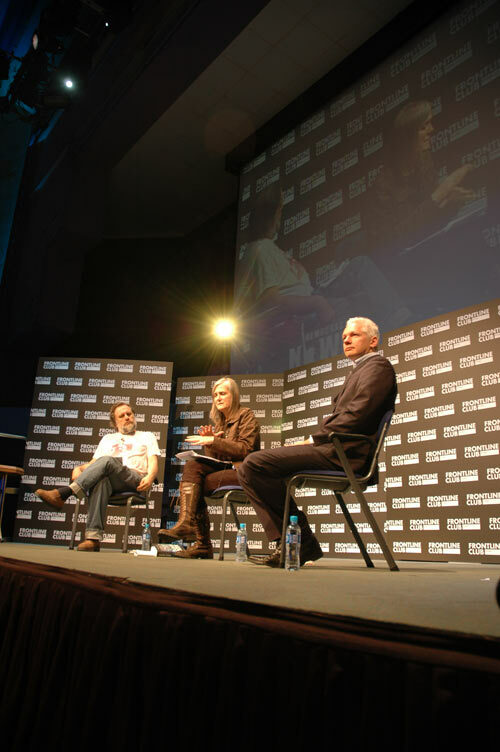 Julian Assange, the Slovenian philosopher Slavoj Žižek and Amy Goodman from Democracy Now! shared a stage at a packed Frontline Club event at the Troxy in London’s east end to discuss the impact of WikiLeaks. Goodman read the statements made against him by US politicians, including Sarah Palin who said he had "blood on his hands" and asked the Australian, who is 40 tomorrow (3 July), to respond. "Obviously they are wrong and outrageous," he said, referring to calls for his assassination made by the likes of Tom Flanagan, a former aide to the Canadian prime minister. "It is worrying that a new Mccarthyism can come up so quickly." Focusing on 2007 footage released by WikiLeaks last year showing US air crew shooting down Iraqi civilians in Baghdad, Goodman said: "Information is a matter of life or death… If more people had seen the videos before they might have asked for an investigation. This is why information is so powerful and important." Assange said that the Iraq War Logs provided insight into the "everyday squalor of war" and were the only account of the thousands of Iraqis killed. "It is of course controversial, but the result was finally that we were the only ones in the world to report that story," he said. The impact of WikiLeaks was emphasised by Žižek during the first part of the debate. "If you give me a couple of hours I will explain it properly," he joked. "First of all we need to consider the context where the leaks acted. We need to consider the way ideology works today. Let’s not be naieve, people knew about the things that were revealed even before, the point is that now they are not allowed anymore to ignore them." Pointing out the essential difference between abstract and concrete knowledge, Žižek, who is famous for his temperament, said: "Isn’t it different if you know that your wife is cheating on you and if you actually see her while doing so! "WikiLeaks has not simply changed the rules,” he said to Assange, "it changed the way we violate the rules, the rules of bourgeois media." Focusing on the mainstream media, Assange credited the US channel Fox News for showing more of the Iraq video and ultimately reporting more of the story than CNN had. Žižek said that Assange was "a terrorist" in the same way that Indian independence leader Mahatma Gandhi was. "As he tried to subvert the British colonial system, Assange is trying to interrupt the normal flow of information. This is a real revolution." Part II of our reports on the event will soon follow. Full video of the event can be watched here and read our live blog of the event here. Photo by Charlotte Cook.